Theme: Water and culture are strongly interlinked. We all know that water is essential to life itself, but it can also affect how we live our lives. Overview: This is cultural activity for kids, which invites students to explore interesting aspects of Japanese culture and how water interfaces with these aspects. 1. Divide class into groups and assign a different piece of art to each group. 2. If each group doesn’t have access to a computer, print out the art and artist descriptions, and hand one set to each group. Also, if necessary, copy, print, and hand out the appropriate questions for each piece. Observation Questions: These questions are based solely on their observation of the art and artist’s descriptions. WebQuest Questions: Students answer these after viewing the recommended web links. Critical Thinking Questions: Students use higher ranking thinking skills to answer these questions. 4. Suggested additional activity, if time allows: Re-enactment: group members form a “tableau” with each member selecting one person in the scene. Copy their body position, facial expression, etc. and freeze. At the signal, each participant unfreezes and all group members interact and act out in action and dialogue what might happen next. 5. Allow 5 minutes per group (20 minutes in all for 4 groups) to display their assigned art piece, present their discoveries and insights – perhaps leading a short discussion, and, time permitting, to act out their one-minute tableau scenes. 6. End with a short discussion of what the students have learned about Japan and the importance of water in Japanese culture. Is water more important to their culture than to ours? The young people here all attend the same __________. Does your school have a garden or a farm? Are they standing on dry ground or in water? 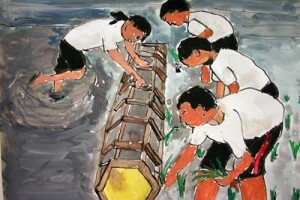 Traditionally men and women have a different role in planting rice. What are they? What time of the year do they plant rice in Japan? Why do they flood the field when they plant rice? Rice is a “staple food” in Japan? What does the term “staple food” mean? What are the staple foods in your country? Does your school have a garden? Do you think it a good use of school time to require students to tend and grow crops? Re-Enactment: (Time permitting) Create a frozen picture (or tableau) by each of you taking the posture of one of the people planting rice in the scene. Try and imagine what your character might be feeling and thinking. Once frozen, at the count of 3, unfreeze and carry out what might happen next by moving and speaking. End the scene after about a minute. Who is in the picture? How many monkeys can you count? What do you think is the white thing on the top of one of monkeys? Does this scene take place inside or outside? 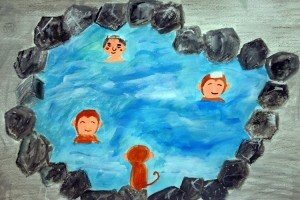 Why do you think Japanese like to take an Onsen bath in a group? What do you think of sharing a bath with other people? In your culture, how important is it to bathe regularly? Re-Enactment: (Time permitting) Create a frozen picture (or tableau) by each of you taking the posture of one of the people (or monkeys) in the Onsen. Try and imagine what your character might be feeling and thinking. Once frozen, at the count of 3, unfreeze and carry out what might happen next by moving and speaking. End the scene after about a minute. What is the name of the animals in the picture? How many do you see? What do you think they are walking on? 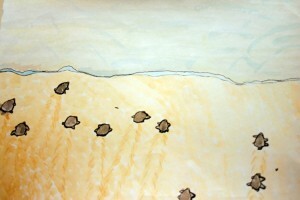 After the researchers on Oshima Island, have dug up and counted the baby turtles, what time of day are they released? Once in the ocean, the turtles make their way to the Gulf of ___________. Find out how many miles the turtles have to travel to get to this gulf. About one in _________ turtles will find their way back to their birthplace to lay their eggs. Why do you think it is important to protect baby sea turtles? Why are so many (100?) baby turtles born at the same time? In Japan the animal turtle (tortoise) represent longevity. Do animals today represent, or have they ever represented, anything in your culture? Re-Enactment: (Time permitting) Create a frozen picture (or tableau) by each of you taking the posture of one of the turtles in the scene. Try and imagine what you, as a turtle, might be feeling and thinking as you have just been released and are crawling towards the sea. Once frozen, at the count of 3, unfreeze and carry out what might happen next by moving and speaking. End the scene after about a minute. What are the workers heating in the large pots? What is the end product they are producing? Hanami Kawaoka’s ___________ works in this factory. Why is salt important to our life? What are the other uses of salt other than in cooking? Do you think the people of Kamagari are proud of their sea salt? Does any product made in our communities make us proud? Re-Enactment: (Time permitting) Create a frozen picture (or tableau) by each of you taking the posture of one of the people in the salt factory. Try and imagine what your character might be feeling and thinking. Once frozen, at the count of 3, unfreeze and carry out what might happen next by moving and speaking. End the scene after about a minute.